We have lived in the village of Hyams Beach having chosen it as an ideal location to bring up our children. We both have a love of the natural environment and really appreciate the idyllic location in which we live. We reside at the northern end of the village with our home backing onto NSW National Park. Hyams Beach Hideaway is located at the southern end of the village. Martin was a manager in nearby Booderee National Park for 32 years prior to his retirement (you'll see a book he co-authored at the villa). He has a PhD in Marine Biology studying the little penguins that reside on an island in Jervis Bay. I am a teacher with a Master's Degree specialising in Early Childhood. I work as a casual teacher at TAFE. We purchased this property so we could keep and share some very special items we have used to furnish, decorate and equip the villa with everything you may need. We are sure you will appreciate our eclectic yet practical inclusions! Hyams Beach can get very busy with day trippers in the summer months. Hyams Beach Hideaway offers a very peaceful quiet setting within walking distance of what attracts people to our very special world renowned location. Once you arrive, you park your car and don't need to travel anywhere if you don't want. No car parking problems and beautiful unspoilt beaches and bushwalks. Watch the sun rise over Point Perpendicular as the dolphins swim lazily by! But if you want more it's not far away. Booderee National Park is an amazing place located in Jervis Bay Territory. 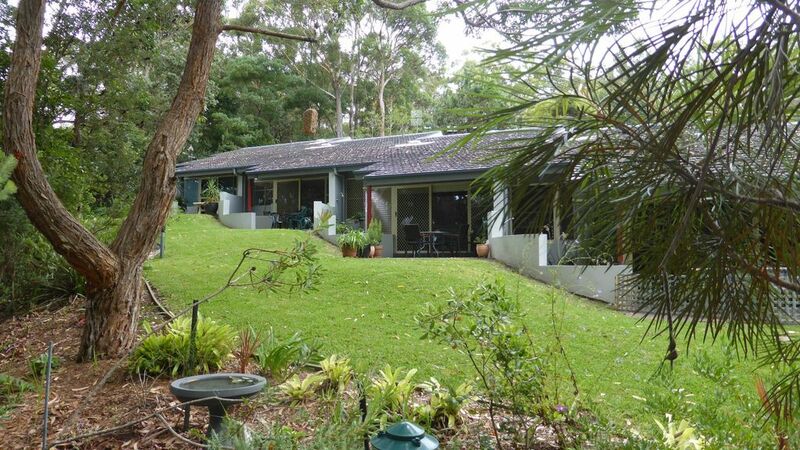 Owned by the local Aboriginal Community of Wreck Bay it offers everything from beautiful beaches and bush walks to surfing and an amazing botanic gardens. Well worth a visit. Need restaurants and night life - Huskisson is a 15 minute drive away. An activity pack is located in the villa and even has ideas for wet weather activities for children. Very small village totally surrounded by national parks - only one road in and out! Dishwasher, large fridge and freezer, microwave. Electric stove, Fully equipped with all you need including picnic gear. Corner cabinet with glasses, carafe and lots more. Tablecloths, drink coasters candles etc. Bookshelf for book swaps - leave a book you finished - take a book you want. Such a lovely, restful spot in a piece of paradise! Thanks - we will come again! Thank you for your lovely review, we are so glad you enjoyed your stay and our villa. We would be happy to have you return anytime. We loved the secluded location only 2 minutes bush walk from the beach and the high quality comprehensive furnishing and provisions. A real gem. We are so glad you enjoyed our little piece of paradise, we hope to see you again in the near future. Your suggestion has been noted and is appreciated. Thank you for choosing to stay at Hyams Beach Hideaway. Thank you, we agree it's a pretty special place. Hope we see you again soon. We are really glad you enjoyed our villa and its location. Thank you for leaving our property so neat and tidy. It's most appreciated! Hope we see you back in the near future.